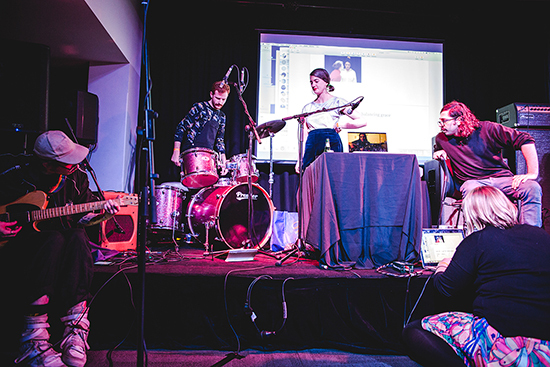 Over the last three years Liquid Architecture has become an integral part of a rapidly expanding conversation around sound-based practices in Australia. 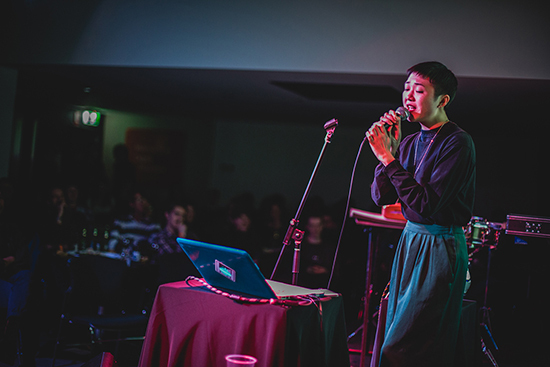 Through a diverse program of events including this year’s Autotune Everything, 2015’s Capitalist Surrealism, and the ongoing What Would a Feminist Methodology Sound Like?, Liquid Architecture is providing a crucial context for a particular set of practices rapidly exceeding ‘sound’ as an appropriate descriptor. 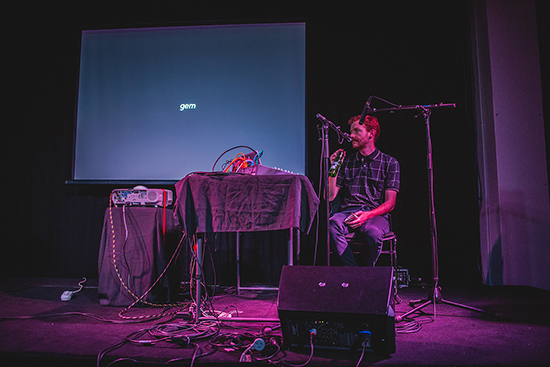 Over three nights at Melbourne’s Greek Centre for Contemporary Culture, Autotune Everything provided a long and varied program of critical and conceptual performances, evoking the Antares pitch correction software as a metaphor for cultural standardisation (sadly, none of the artists actually used it). Autotune limits an incoming vocal signal to a predetermined range of notes, typically those within a given key, scale or mode in order to guarantee conventional musicality. When a singer sings through Autotune, the software will automatically ‘correct’ the pitch by shifting it to the nearest note—one cannot sing a ‘wrong’ note through Autotune. If we apply this restrictive logic to culture, politics, listening and seeing, we arrive at the central problem addressed here: everything appears to be Autotuned in some way. Thus the Liquid Architecture team focuses on Autotune’s subtractive qualities. The implication is that in our time as in all others, only certain modes of political and social organisation are thinkable; only certain sounds are hearable, certain images seeable and only certain statements sayable—all human activity is constrained by some physical, social, psychological, or anatomical limit. The works in Autotune Everything all speak to this basic truth in some way. How can we think the unthought, hear the unheard and see the unseen? Is hearing possible outside the frameworks we rely on to make sound intelligible? What would these expanded practices sound like? Andrew McLellan’s performance Unilateral Directories is concerned with the increasingly polarised nature of political discourse and the overwhelming volume of information we often consume (or perhaps, more accurately, are exposed to) on a daily basis. As Facebook filters the news to reflect our views, our opinions are funnelled back to us through an algorithmic echo chamber. McLellan feeds diametrically opposed journalism (articles from The Australian vs New Matilda—though it is not apparent which articles) through a patch that renders a single word at a time on a screen. Words taken from the headline, the article and the comments section scroll endlessly while McLellan desperately tries to keep up, reading the words aloud as they fly by. As the speed and volume begin to exceed his capacity to read and speak, the data jam is rendered physical via the performer’s body. As comprehension becomes impossible, McLellan begins to choke on the words and his facial expression freezes, suggesting saturation point has been reached. The performance climaxes in an explosion of vocal pyrotechnics that bursts through the echo chamber, revealing the embodied entity lurking behind the echo. Chun Yin Rainbow Chan’s work, titled Broken Vessel of 1996, operates in more personal territory. The reference to Walter Benjamin’s 1923 essay “The Task of the Translator” in the title hints at the theme. Via Google Translate, Chan gives a potted account of her family’s migration to Australia in the year 1996. As Google Translate has no setting for her native Cantonese, Chan is forced to speak into her phone in Mandarin. What comes out in English is a humorously garbled yet poignant description of the process of adapting to life in Australia. Chan describes losing the ability to communicate in precise Cantonese with her parents and becoming what they mockingly refer to as a ‘Banana’ (yellow on the outside, white on the inside). Following this Chan launches into karaoke versions of “Killing Me Softly,” “Wannabe” and “Unbreak My Heart.” The songs refer to a box of VHS tapes that accompanied the family on their journey—a time capsule of a popular culture left behind in Hong Kong, but which bleeds into this new and different context. The songs are sung in Cantonese, in a literal phonetic translation that violates the tonal specificity demanded by the language. As such the songs exist in both and neither worlds; they are in Cantonese but are bastardised by English phonetic structure. The performance reimagines the process of translation and the experience of the first generation migrant. German composer Johannes Kreidler took the audience through two of his works—Product Placement (2008), and Fremdarbeit (2009)—explaining the works verbally and demonstrating them with the aid of documentation. The first is a 30-second composition made of 77,200 samples. On completing the work, Kreidler attempted to register it with GEMA, the German equivalent of APRA. He arrived at their office with all 77,200 printed forms required for registration. So emerges the social and political territory of the work—a critique of copyright law and the ways in which its attendant bureaucracy structures and controls creativity. The presentation was interesting, and the crowd laughed audibly throughout, although it is unclear why the work is being discussed in this context given its age and the obviousness of the critique in 2016. An interesting tangent might be to note that since (and before) this work was published in 2008, music and other forms of cultural production have in practice been forced to sidestep copyright restrictions rather than continue to confront them in the explicit manner of artists like Negativland or John Oswald (both of whom made similar critiques a central theme in their work dating as far back as the late 70s). Hip Hop production’s move away from sampling practices since the early 2000s seems relevant here as an instance in which the kinds of cultural constraints the Liquid Architecture team is trying to critique might actually be thought of as generative. The second work Kreidler presented, Fremdarbait (German for ‘outsourcing’), focuses on the inequity inherent in trade relations between wealthy countries and their partners. He brings attention to the devaluation of labour in non-Western countries by outsourcing his composition to an Indian programmer and a Chinese composer. Kreidler describes in very matter of fact terms how he paid them $15 and $30 respectively for the privilege. There were four pieces in total, all performed at Autotune Everything by an ensemble of white classical musicians, presumably being paid for their time. In the first piece, the Chinese composer, named by Kreidler as “X Xiang,” was asked to write a piece in the same style as Kreidler’s other works. In the second, a programmer from India named “Ramesh Murabai” was paid to write software that would automate the composition of similar works. In the third Xiang was asked to write a piece using Murabai’s software. In the fourth Xiang was asked to write a piece which incorporated 20% “plagiarised” material, in the form of a Maria Callas sample. What emerges from all this composition, primarily, is a critique of neo-liberal logic and the economic brutality of globalisation. Kreidler states in an interview on his website that refers to the work, “Tonight’s goal is that no one here tonight will vote for the EDP [German neo-liberal party] ever again.” As with the first piece, the temporal lag between the creation of the work and its presentation here is instructive. Given the pervasive nature of neo-liberal critiques, events such as the Seattle WTO protests and recent movements such as Occupy—it is unclear who exactly will be surprised to learn that globalisation extends to musical composition. Fremdarbait is certainly an interesting work, with many possible interpretations, but I think what it ultimately provides is a demonstration of Kreidler’s rhetorical, formal and aesthetic virtuosity, rather than a new perspective on the global economy and labour practices. A broader question as to whether representation equates to critique is also relevant to Kreidler’s work: does simply re-enacting a set of injustices do anything to ameliorate them? Melbourne artist Eric Demetriou’s work—titled Makiko Yamamoto presents Eric Demetriou who presents Camila Galaz, Sam George presents Travis John, Joel Stern presents Kalinda Vary—was an hilarious exploration of the absurdity of the rituals of cultural production. The work roughly mimics a chat show format, where Demetriou obsesses over the social and political details of organising his band. Makiko Yamamoto interviews Demetriou throughout the performance, but they consistently fail to reach meaningful dialogue. Demetriou derails the lines of questioning, always bringing the conversation back to his own genius and his neurotic mode of inflicting it on others. There are live and not-so-live crosses to former and present band mates, who are in various states of disinterest with respect to the project. The performance climaxes when the band—made up of various collaborators and audience members—manages to play a shambolic cover version of “Total Eclipse of the Heart.” Demetriou’s orchestration of this moment is a humorous allegory for the difficulty and complexity of organising a group of people to do just about anything. 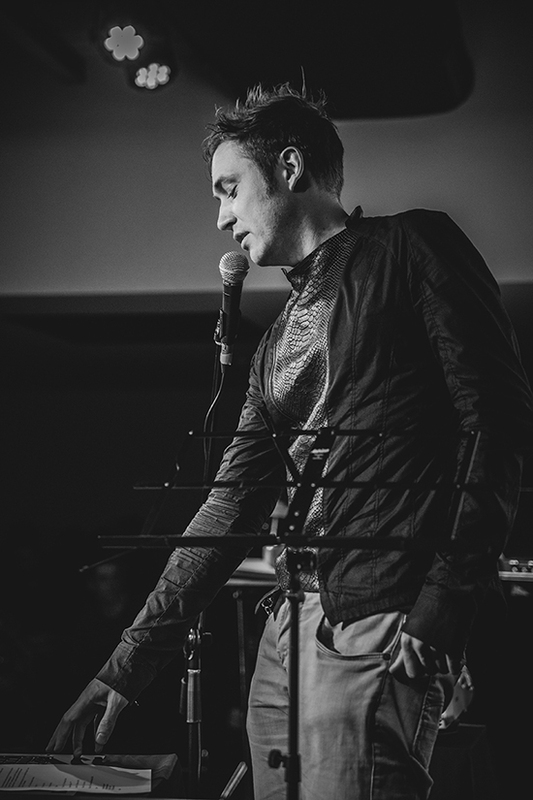 Chicago-based academic Seth Kim-Cohen delivered a performative version of his 2013 polemic, Against Ambience. He read out an edited and condensed version of the book while playing guitar through a series of pedals. There was an accompanying Powerpoint presentation with his academic credentials in the footer, various quotes from art critics and images pertaining to his examples. Each time he said “see,” he would pull out a digital camera and take a picture of the crowd. At a certain point his voice became inaudible, drowned out by the guitar drone. To provide some context, Kim-Cohen’s book frames certain art practices as ‘ambient’ (James Turrell and Brian Eno are two notable bugbears) and argues they are insufficiently social, discursive, political and relational. Citing a rush of seven shows in New York in 2013, Kim-Cohen argues that the recent popularity of ‘ambience’ has ushered in an event no less momentous than “the symbolic death of conceptual art.” For Kim-Cohen, the conceptual traditions inaugurated by the “linguistic turn” of the early 60s are in danger, threatened by a rash of vapid, crudely sensual art. 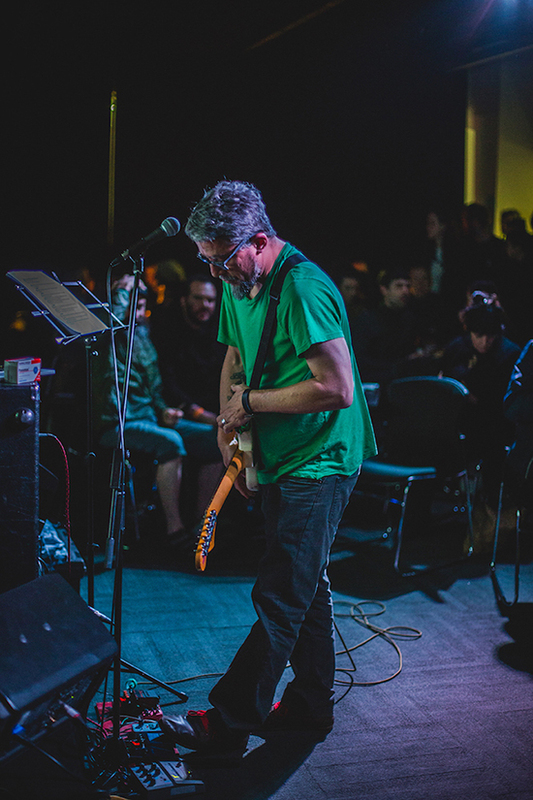 By his account, ambient practices promote a singular, passive, subsumed mode of interaction that is not representative of the kind of relational, political, critical and conceptual sound-based practices Kim-Cohen would like to see and hear. Transposing this argument back on to Kim-Cohen’s performance is a perplexing exercise. Perhaps he’s trying to problematise the ‘ambience’ of his own guitar work by highlighting its tendency to drown out the efficacy of his words. Perhaps he is trying to demonstrate the way in which sound is always pregnant with meaning—as if his arguments are somehow contained in the guitar drone. Is he beckoning us to extract the discourse embedded in sound? Or is he performing an immanent critique of his own performance by generating a vacuous apolitical experience? There is no neat conclusion to draw, perhaps necessarily so, and I think the work is most usefully construed as constructing a murky interpretive zone in which competing ideologies, (ambience vs conceptualism, if you like) jostle for ethical and intellectual high ground. A new version of an old binary? Aside from forcing me to engage with his book, (there is no choice for someone wishing to understand the work), Kim-Cohen’s awkward superimposition of a pre-existing argument onto a performance raises another set of questions. If conceptuality and discourse are to be taken as not only a background of interpretive possibilities but as the work itself, what remains of live performance as an aesthetic form? And what sort of ideological conflicts are at work in this apparently benign desire for the primacy of discourse? What seems to emerge in Kim-Cohen’s writing is a general assertion that critical discourse and conceptual practices are more sophisticated than other ways of doing things. A binary is constructed whereby the realm of the popular/explicitly aesthetic and the more rarefied, prestigious and self-consciously intellectual realm of critical thought and its attendant practices are put in opposition. This strikes me as a new version of a very old, Eurocentric, high vs low binary. In this conception of culture, discourse is the self-appointed arbiter. It comments on, analyses, critiques and appropriates the culture beneath it, producing a rarefied reflection that has come to constitute its own culture of detachment and reflection. There is certainly a place for this thinking, and Liquid Architecture’s curatorial ventures pose an interesting and relevant problem: can discourse, interpretation and critique ever be primary mediums? Can criticism ever exceed that to which it refers? What happens when these principles are mobilised as entertainment in the form of sound-based performance? This conversation between ‘content,’ ie the world of popular aesthetic production (taken to include art) and the possibilities contained in its critical appraisal via performance, is to my mind the axis around which the Autotune Everything program ends up revolving. Questions of cultural standardisation recede into the background. When is criticality its own form of ‘ambience’? Rather than championing criticality and conceptual intent as some sort of end in itself, a more interesting gesture might be to ask: when is criticism its own form of virtuosity? At what point, particularly in the mildly corrupt world of academic publishing, is criticality its own form of ‘ambience’? A central problem in Kim-Cohen’s argument emerges with the consideration that ‘ambience’ is no more or less imbricated with capital than criticism and conceptuality. These immaterial, or de-material commodities (Kim-Cohen thinks there is a difference), are arguably functions of the art market. Interesting critiques and ideas drive the relentless production of the new. Conceptual frameworks, elaborated in so many paid-for catalogue essays and artist statements, differentiate cultural products that are aesthetically equivalent. Seen in this light, ‘ambience’ is a straw person that implies the commodification of certain practices while mysteriously excusing others. If we take critiques of neo-liberalism seriously, it is clear that in a contemporary context subsumption is complete and automatic—re-enacting critical discourse as live performance does no more to address this than Turrell’s grandiose light shows. Additionally, I think there are some unacknowledged interests bound up in the value system established in Against Ambience. Chiefly, a barely concealed desire for ‘sound’ (whatever that might be and however we might designate its limits) to operate in the same rarefied realm of prestige and distinction as the visual arts and academia. Why can’t sound works have weighty catalogue essays? I can’t avoid the suspicion that this elevation of sound to critical discourse is in no way emancipatory, rather, it merely domesticates sound within the same stable of discursive art practices on rotation in the academy. While I agree that sound-based art works can operate in this field, I do not believe Kim-Cohen presents a coherent argument for why they should. Perhaps it is unfair to single Kim-Cohen out here. His stated goal of encouraging practices that engage with “institutional critique, gender politics, economics, the AIDS crisis, foreign policy/cultural imperialism, globalism, philosophy, interpersonal and societal power relations and the distribution of knowledge” is laudable. But by critiquing Against Ambience, what I would like to do here (and what I think Kim-Cohen and Liquid Architecture have effectively done with Autotune Everything, intentionally or not) is to hold a mirror up to the practices that purport to hold the mirror—in order to clarify what these critical practices do. This is of course an open question, and Liquid Architecture is attempting to generate these discussions at a timely point in the trajectory of sound as a medium.